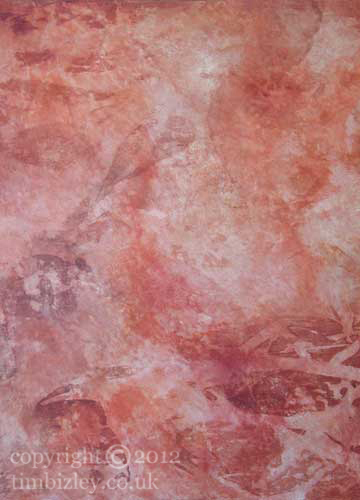 This paint effect is created by a partial removal of glaze using paper, newspaper is particularly useful but can leave print behind which is visible on lighter colours. The best newspaper is pink and is relatively print fast. Thicker papers such as lining paper leave a different impression. In this example further applications of paint were made using newspaper as an additive technique. In fine art terms this technique is referred to as "frottage". Though this has become an equivocal term.